A few years ago some friends of ours took John and me on a tour of Manhattan. Not Manhattan the Big Apple. The little apple. Yes, Kansas has a Little Apple and it’s in the middle of nowhere and it happens to be quite charming. Besides having the some of the most crazed, insane fans in all of college sports, it has the most charming little boutiques, cafe and coffee shops – perfect for a day’s worth of exploring. 1. Go to Varsity Donuts for some of the best donuts you’ll EVER have. 2. Go to Radina’s for a true college-town coffee shop experience. 3. Go to So Long Saloon and order the raspberry chipotle bean dip. It is to die for. In fact, it was one of the primary reasons we went to Manhattan in the first place! Our friends bragged on it so much and insisted we go to this packed bar in the middle of downtown and try this dip. One bite in, I understood the obsession. 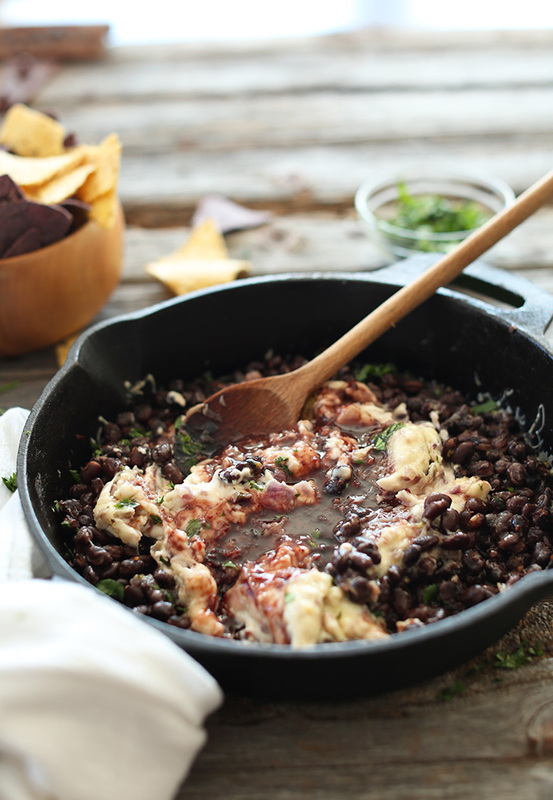 This dip may sound a little wacky – black beans, cream cheese and raspberry chipotle sauce? But odd as it may sound, it is out of this world delicious. The awesome thing about this recipe? It comes together in about 30 minutes and it’s gluten-free and vegan optional. I made it vegan for my dairy-free friends (myself included), but you certainly don’t have to. Plus, it serves a crowd. If you’re having company or watching the big game or hosting a dinner party, this is the perfect thing to serve. It’s filling and scoop-able and delicious piping hot or room temperature – the perfect kind of dip for grazing over the course of an event. The preparation is also quite simple. Saute red onion and garlic, add it to cream cheese and stir. Heat your black beans with a touch of spices and salt. then top with grated pepperjack cheese. Broil till bubbly then eat! The whole process takes about 30 minutes and leftovers keep and reheat well. Trust me, you’re gonna love this dip. You can either serve it as is after cooking or swirl it around to meld the flavors. I only did so slightly for visual appeal, but you can also just use a chip to scoop and swirl as you please. This is my homage to the original, but it’s not as good as the one you’ll find at So Long Saloon! So if you ever find yourself in Manhattan, Kansas, you know what to do. Enjoy! A vegan, gluten-free dip with loads of flavor. 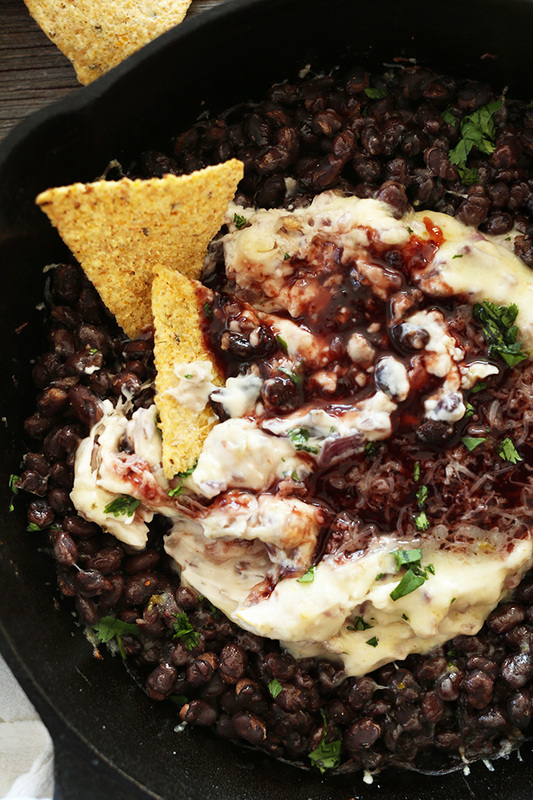 Black beans provide lots of fiber and protein, the vegan cream cheese a luxurious texture, and raspberry chipotle jam a touch of sweet and heat. 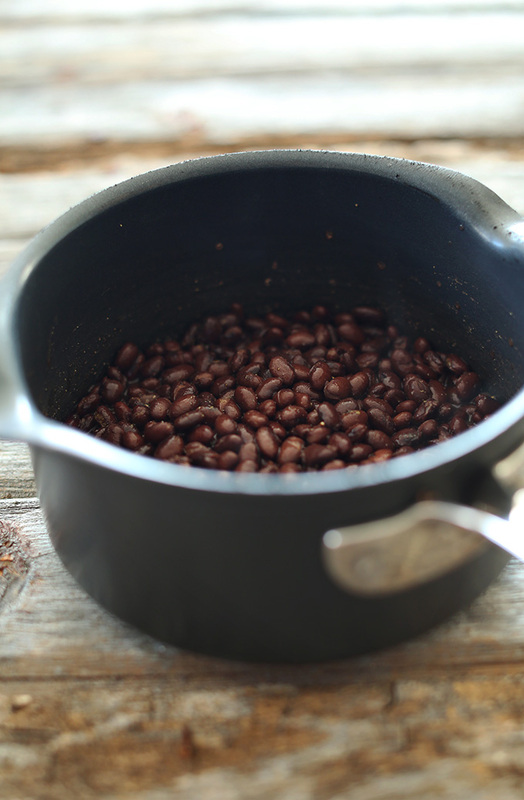 In a small saucepan, heat the beans along with salt, pepper and cumin. Once warmed through, taste and adjust seasonings. Set aside. Add 2 Tbsp olive oil to a 10- or 12-inch cast iron skillet (or oven-safe skillet) over medium heat. Add onions and a healthy pinch of salt and stir. Cook until soft and fragrant stirring frequently – about 5 minutes. Add garlic and cook 2 more minutes. Then add to a mixing bowl with the cream cheese and stir. 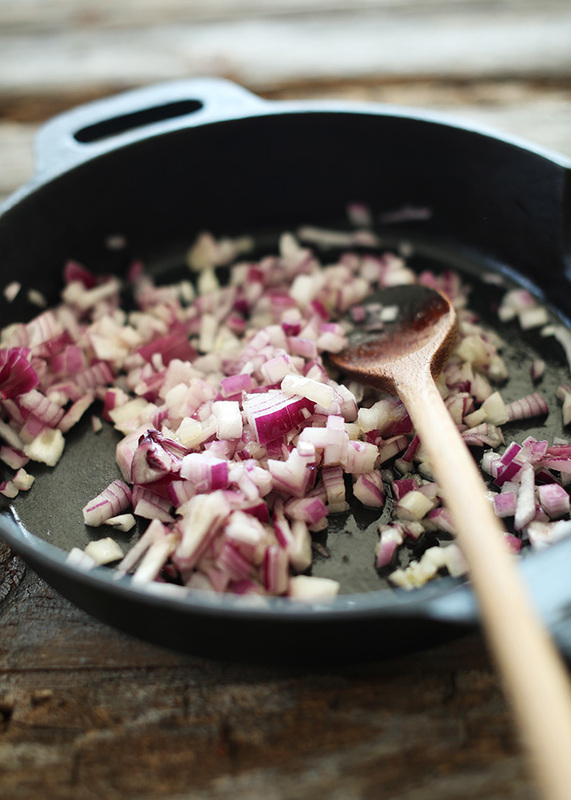 Removed from the stove top, add the cream cheese-onion mixture back to the cast iron skillet. Place it in the center and make a well (or just spread it in an even layer on the bottom for more even distribution). 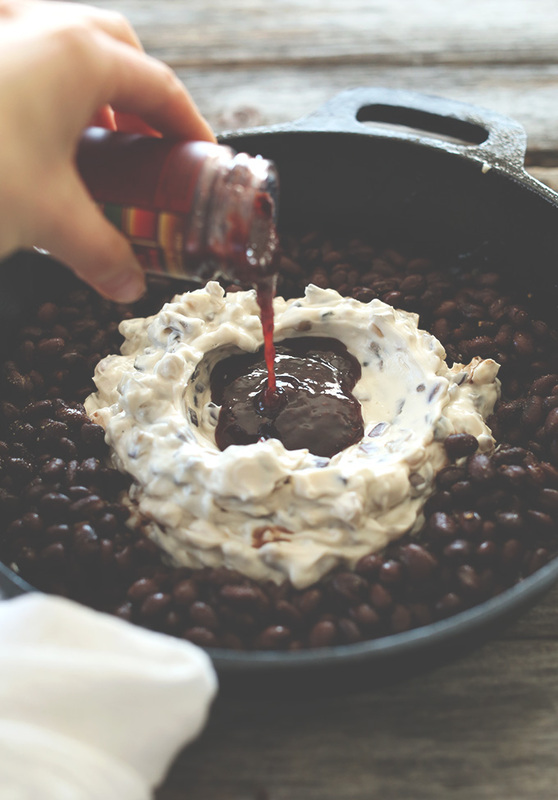 Add the black beans on top around the outside of the cream cheese, and pour the raspberry chipotle sauce in the center. Sprinkle the cheese evenly over the top (optional but recommended) and bake for 12-15 minutes or until warmed through and bubbly and the cheese is melted. Remove from oven and top with a bit of additional cheese and fresh cilantro (optional). Serve immediately. You can either swirl everything around first to combine flavors, or let people scoop into it with chips and get a little bite of each ingredient. Leftovers will keep covered in the fridge for several days. Just reheat in the microwave or the oven. *Nutrition is a rough estimate calculated without chips. I found your blog when I went looking for this exact recipe. It was in circulation with my college friend group at one point, but I lost track of it and plan to make it for the Oscar’s this weekend. 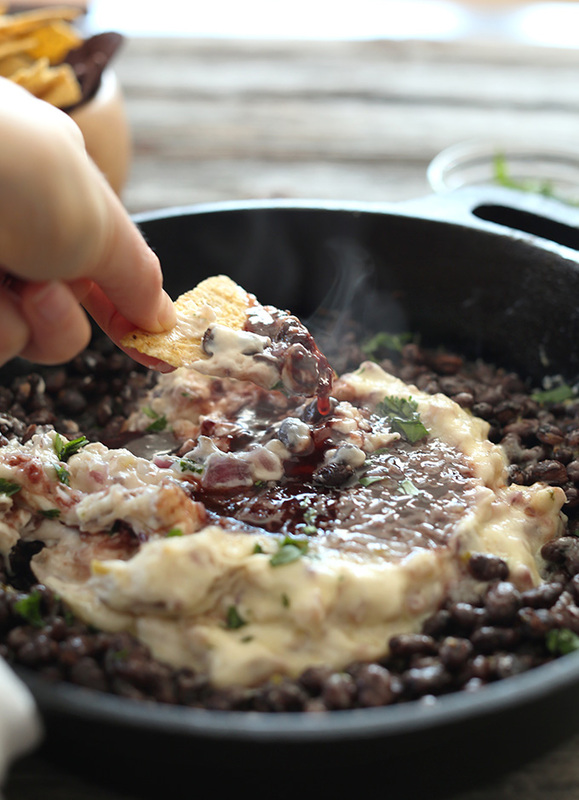 One of my favorite birthday memories was eating this dip and sharing beverages with my college roomies at So Long Saloon while the rain poured down outside. So cozy! Thanks for faithfully replicating my food memory. I’m so glad you enjoyed your time in our little apple! I love this recipe! I’ve made it a few times and have put the left overs in quesadillas:) I made my own raspberry sauce from both fresh and frozen raspberries. Thank you! Cool recipe. Can’t wait to try it but what chips are pictured?! Hi Janessa! I think they were Trader Joe’s! Tasted today at little apple, it was awesome. Probably try this menu at home, Thanks to sharing! Love love LOVE Manhattan KS and the So Long Saloon! I’ve made this myself a few times after having it there, SO glad that someone made this available to the world! So trying this tonight! Hopefully I can find the raspberry chipotle sauce at my whole foods! I went searching for the raspberry chipotle been dip from So Long Saloon and so happy to have found your recipe!! Best bean dip, hands down. Thank you for posting! I’m drooling just thinking about it!! We’ve made this recipe a few times, once as the main course split by my husband and I and another as a side for a larger shared meal with friends. It is incredibly satisfying and filling! 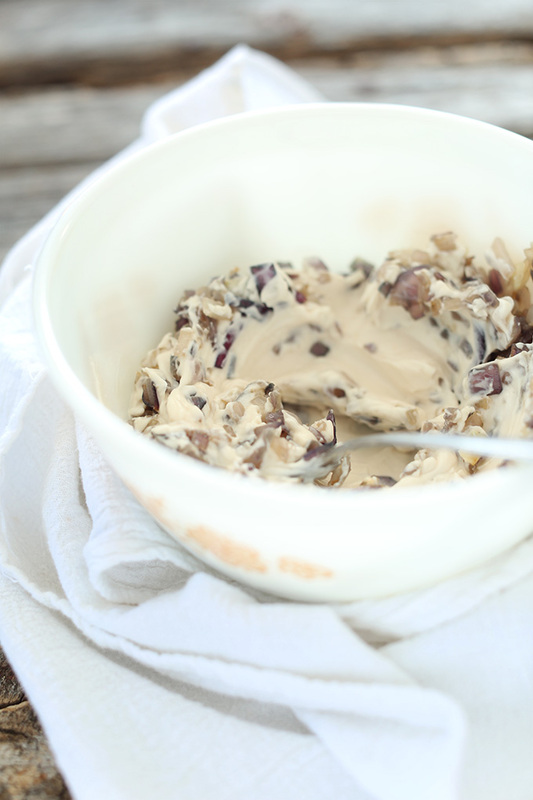 Everyone has loved and been surprised by the flavors of this recipe! So I was perusing your snack recipes for something to take to a potluck at work tomorrow and was so excited to find this recipe. I graduated from K-State a few years ago and definitely miss Varsity Donuts and Radina’s! I live in Denver now and there are lots of great doughnut, coffee, and food options, but MHK will always hold a special place in my heart. I can’t wait to share a (vegan) taste of Manhattan with my coworkers! I’m so happy I found this I go to K-STATE and this is one of my all time favorite things!! Thanks for the recipe, fellow townie. Having guests over for dinner and was stoked to find your site. I was happy to see radina’s on your list of places to visit! I worked there and miss it terribly! Living in a small college town offered a great sense of community! 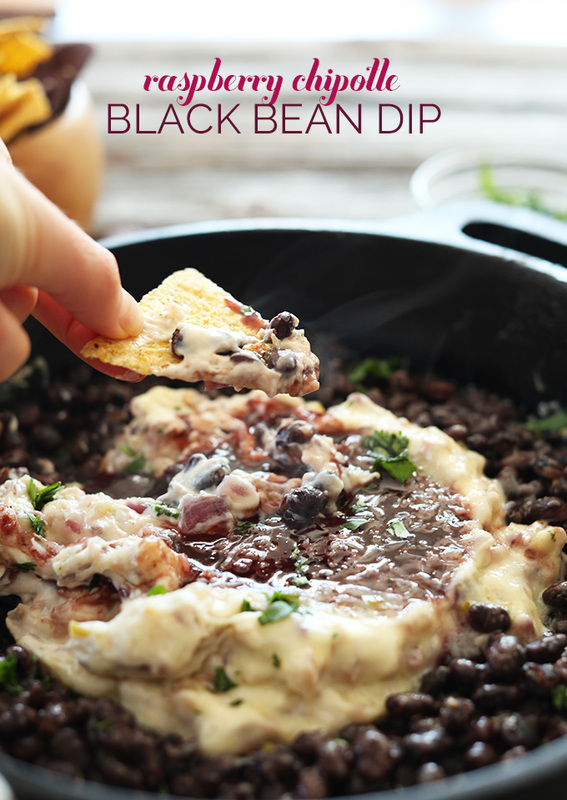 Just stumbled across your blog while looking up the recipe for so long’s black bean dip! It’s definitely a game changer! Made this today for a large group of cheese loving Wisconsinites and it was devoured! I had multiple people ask me for the recipe. I made my own raspberry chipotle sauce too. I don’t always love daiya cheese but in this instance it worked really well. Thanks! I will definitely make this again. I graduated from K-State 10 years ago and still miss So Long! I’d always start with the dip and fried pickles and move onto a Boulevard Wheat with the Get Nekkid! Then not eat for three days after that. Oh to go home again! Thanks for the reminder! Haha, nice! Glad you enjoyed this, Kelzee! You just became my favorite person! 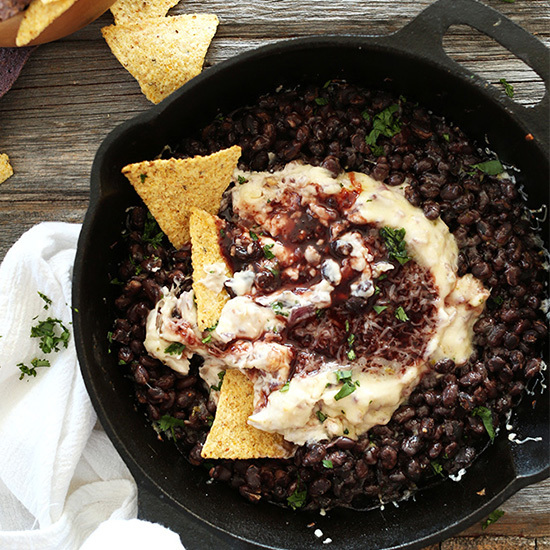 I LOVE So Long’s black bean dip. As a K-Stater, we lived for this appetizer. I love your simplicity with it and not over thinking the ingredients. I am definitely adding this to our next party! Thanks Meg! Glad you found us! Do you still live in the Midwest?! Oh fun! We live in Midtown. Great to “meet” you. It’d be fun to get together sometime. Just had to say that I made this last night…DELISH! My husband and I could not stop eating it! Ha! I get you there. I was raised a Jayhawk and really am not a KSTATE fan. BUT, this dip does make me grow a fondness for Manhattan. That and Varsity Donuts. OMGEEE. Insane. As soon as I saw the title of this post, I thought “that sounds like the dip at So Long Saloon in Manhattan!” My best friend went to K-State and made SURE to introduce me to this stuff before she graduated :) Thanks for the flashback! 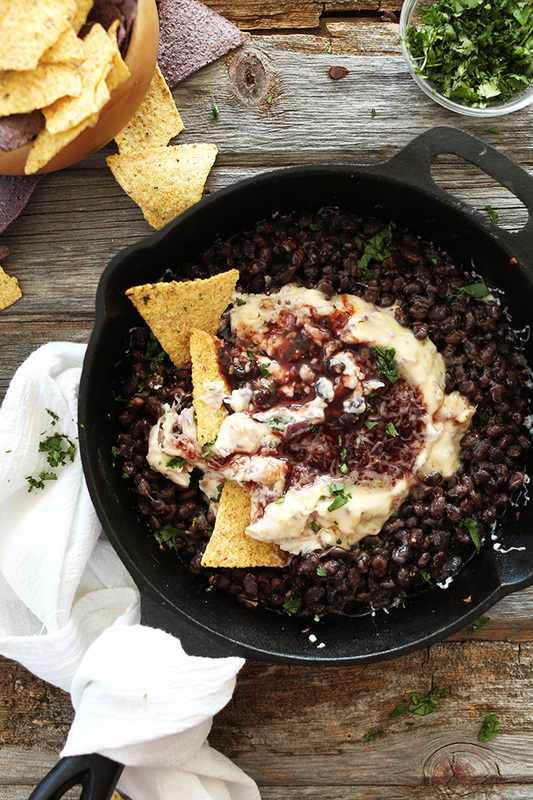 So Long’s black bean dip is amazing!!! I love So Long! I’m not a big meat eater, but even I would order a burger there. I’ve been making this dip for parties forever, and people are always shocked at how simple the ingredients are! I was going to share a recipe on my site, but it looks like you beat me to it, hehe! I’ve called the little apple my home for 6 years! In fact, I left the big apple to downsize to this one. You’re list is pretty accurate and this dip, while delicious, is just as good made at home (which is how I usually do it now). I must say that you’re missing a few key things. 1) The Co-Op there is SO cute. It’s still little and run by a small group What a food co-op was meant to be! 2) Radina’s is ok, (if you can find a table during finals) but Arrow, a new shop, is even better. 3) The best place to grab a drink is in a old speakeasy called Auntie Mae’s Parlor. It looks drab but it’s the oldest bar in town (that has never closed for a period of time) and has good atmosphere, strong classic cocktails and a staff that thrives in the space below ground. 4) If you’re there late night, Varsity doughnuts has a food truck in the back. You can get doughnuts fresh from the fryer and super unhealthy snacks like maple bacon fritters and grilled cheese mac and cheese sandwiches. 5) To walk off all that food go to the Konza. It’s beautiful! Now that you’re travel guide is complete, come back some time! Thanks for the tips! I’m planning a trip there sometime this summer and these stops sound delightful! Kaitttttt….yes to all of these except that I haven’t had a chance to go to Arrow yet. I miss seeing your face at radina’s and what not. 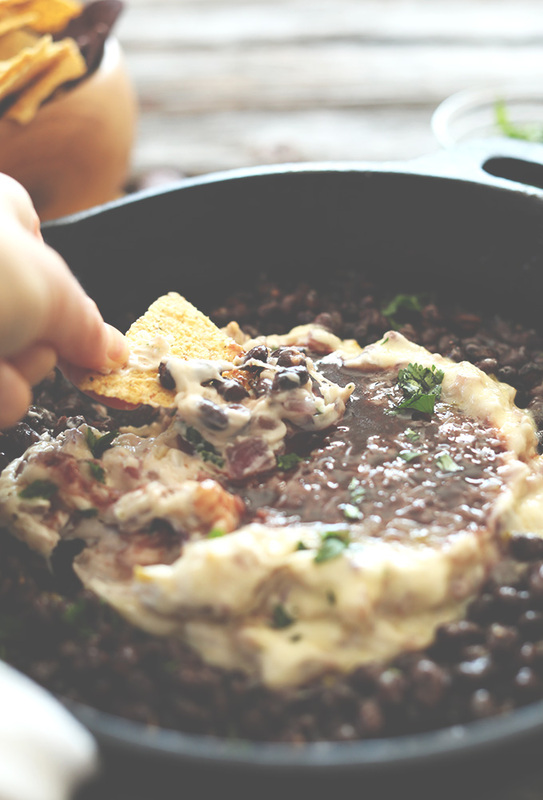 At first I thought that this recipe sounded a little bit strange, but reading on and looking at the pictures I’m not thinking that I need to eat this Raspberry Chipotle Black Bean Dip right now! I am very intrigued and will have to give it a try! I know, so weird sounding. But so good! Hope you give it a go, Isadora! A definite do!! Sounds delicious! This recipe is so inventive and has my mouth-watering! I NEED to try this!! Oh gurl, you speaking my kind of cray cray with this recipe. Seriously though, it sounds great. Alas I do not have a World Market nearby to purchase some raspberry chipotle sauce. Yesterday I was at Whole Foods, which is about an hour away from where I live, and I saw a different brand of said sauce but it was seriously 8 dollars (ahem, I was at Whole Foods after all….and I had already purchased some unnecessary food splurges like some dragonfuit and jackfruit). Any suggestions on concocting a homemade version? I thought I could mix up some natural raspberry preserves with a can of chipotles in adobo sauce. Thoughts? Also I was going to sub cream cheese with goat cheese, since I usually have that in stock. Hmm, not sure! I would say subbing just another jam, such as plain raspberry, and then stirring in some chipotle peppers or powder! Hope that helps! I just about choked on my coffee! I’m feeling practically famous since I’ve lived in Manhattan my whole life! :) I agree, Varsity donuts are amazing. I’ve never even heard of this dip, but it also sounds amazing. I’ll have to go find it, try it, and then make this copycat. Thanks for sharing, pinned! Ha! Manhattan is quite lovely. So wonderful that you’ve lived there your whole life! Thanks for sharing. I love knowing of readers in our neck of the woods ; D Varsity Donuts? I could eat nothing but their fresh blueberry donuts for life and be quite content. Cheers, Mary! SCORE! I already have some refried black beans left over in my freezer. I was just thinking today, what would I do with them? Living in Texas, there’s always a berry/chipotle jam or sauce around. So, I know what type of dip to whip up in the next couple of weeks, perfect for my DVD Saturdays. Love it! So glad you can try this dish. It’s a lovely Saturday snack! Such a beautiful place, no? But Barcelona!? Even better! Jealous. Manhattan!!! The wee lil’ Apple…one of my favorite places ever. Now I am craving a Radina’s latte and a Fruity Pebbles donut. This recipe looks divine! Can’t wait to invent a reason to try it! That reason might be that it’s a Tuesday, but whatever. Oh yes please! I would adore that!!! Let’s make it happen! Yes, Kansas is deceptive with our faux Manhattans : ) Hope you try the dip! And thanks for sharing the story. Always love hearing from readers! I haven’t had been dip in so long, and I don’t know why because it’s awesome. So addicting. But with raspberry, now that just sounds amazing. And I love exploring parts of your city that you haven’t before! Dana OMG this is so me! 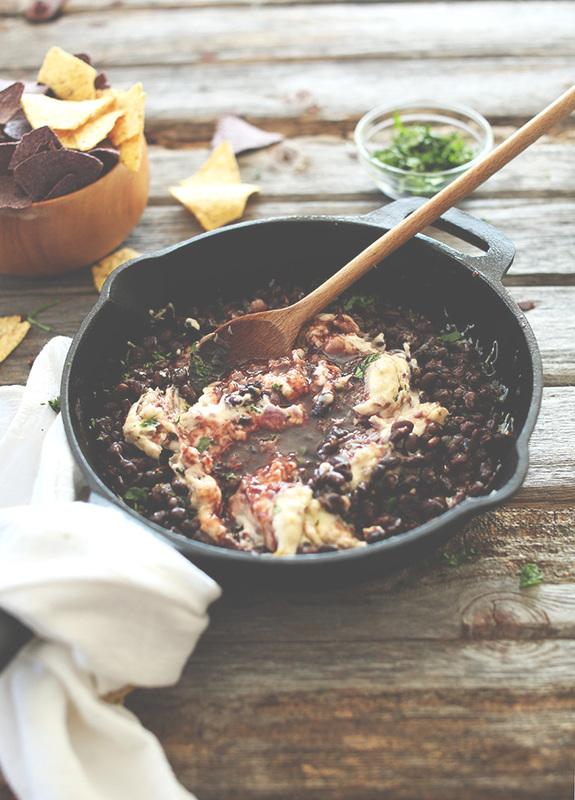 The raspberry and the sweetness against the savory black beans with the chipotle smokiness. HEAVEN! Pinned! Sounds like it would be worth the trip to Kansas for this dip. Isn’t it incredible what food can do? I will tuck this recipe away and definitely try it someday. Loving all the fun flavours in this!! It looks awesome!